This screen can be reached from the Main screen, using the "Export Layout as Template..." option under the the File menu. Templates allow you to export elements of the current project for easy use in other projects. This can include an entire visual layout, or just a selected set of Display Objects. You can change the templates shown in the Template Menu by modifying the template files in the "Templates" sub-folder within your "My Documents\QuickPIP" folder. See the Template Menu documentation for more information. Display Objects - Use the checkboxes to select which Display Objects will be exported into the template you are creating. Click on the name text under "Template Name" to edit the name of the object within the new template. 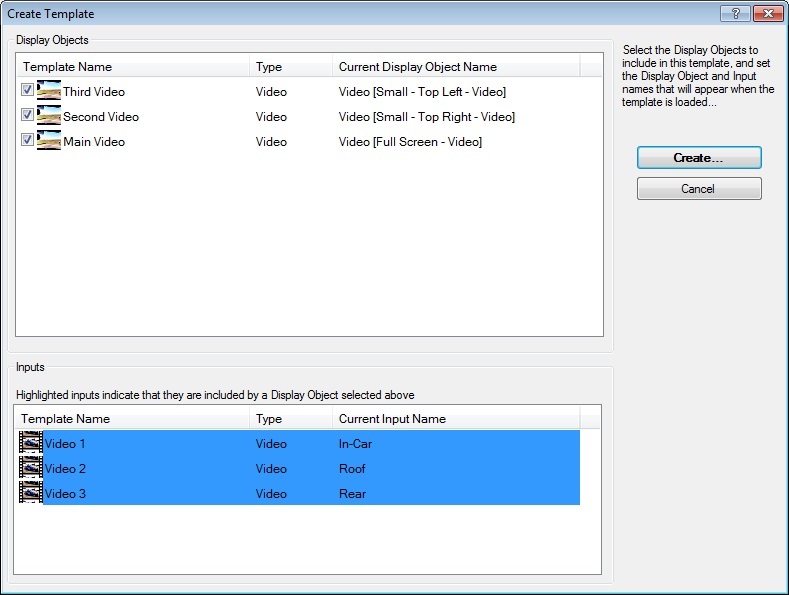 Inputs - The inputs that are associated with the selected Display Objects will be highlighted. Click on the name text under "Template Name" to edit the name of the input within the new template. This name will appear on the Template Load screen when the template is loaded. "Create..." button - Selects the template file name and creates it.